Micro-pit texture has been shown to improve the characteristics of friction between the surfaces of the material. The influence of micro-pit texture parameters on the coefficient of friction between the wood surface and cemented carbide was investigated, so as to provide reference and guidance for the design of textures for the surface of wood cutting tools. By establishing a basic model of friction in wood cutting, the main factors affecting the friction force were analyzed. Friction was analyzed in both air-dried and green specimens of wood from the northeast China ash (Fraxinus spp.). The influence of the depth, area ratio and the diameter of the micro-pit on the friction coefficient was compared. 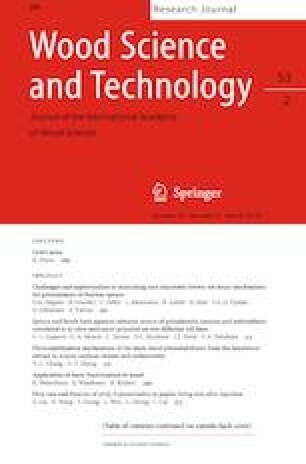 The coefficient of friction between the micro-pit texture surface with a diameter of 80 μm and the surface of air-dried and green specimen was less than of non-textured samples, with a friction coefficient of 0.1461 and 0.1184, respectively. When the diameter of the pits was 120 μm, the optimal micro-pit area ratio was 10% and 20% for the air-dried specimen and green specimen of the ash, respectively. When the size of the textured area and the diameter of the pits remain unchanged, changes in the depth of the micro-pits do not have an obvious influence on the friction coefficient. Therefore, the friction coefficient can be reduced by optimizing the diameter and area of the micro-pit surface texture. Weiguang Li and Zhankuan Zhang have contributed equally to this work. The authors are very grateful for financial support from the “Fundamental Research Funds of the Research Institute of Forest New Technology, CAF” (CAFYBB2018SZ015).